Gathering together with friends and family during Christmas time can be a prime opportunity to introduce preparedness into their lives – or expand on a small interest in survival and the skills they already possess. We can do far more than simply hand our loved ones an Alice packed filled with gear that costs us a small fortune and they won’t know how to use, anyway. Giving a gift, no matter how nice and well-intended, will not help save the lives of those we care about if it is simply tossed into a closet to gather dust. Sure, they might recalled where the bag or similar item, was tossed a few years back, but grabbing the gear when in the midst of panic because the SHTF, is definitely not the time to open it up and try to figure out how to use all the survival supplies still packed carefully inside. Instead of wrapping up a gas mask to give a non-prepping loved one, buy or make a gift that is an essential part of living a prepared life, but does not necessarily wreak “SURVIVALIST.” Teaching those folks we want to live through a doomsday disaster how to do it will require baby steps, if they are not at all currently inclined to embrace our self-reliance mindset. • Car emergency kit in a caddy you make or buy. This is a perfect preparedness gift for a teenage driver, an adult child going off to college, or someone who has a lengthy commute to work, or drives long distances for vacation. Several years ago my husband bought white 5-gallon buckets, painted a red cross on them, and carefully packed a bunch of emergency car items inside, for all of the teenagers and young adults in the family. They all loved the gift, and enjoyed digging through their buckets and asking questions about all of the treasures they found inside. He included a small amount of silver so they could barter for gas or other essentials during an emergency situation. • Bread machines also make great preparedness gifts. Learning how to make bread, even if using electricity to do it, will help enhance the self-reliance skill set of a loved one. You can buy or make (printed recipes placed in a binder) a bread making cookbook that is filled with pioneer style recipes that also offer instructions on how to make bread and baked goods the old-fashioned way, without the aid of modern technology. • Buy a sewing machine and some basic supplies, including a binder full of free patterns downloaded from the internet. Learning how to sew using modern technology will still teach the basic skills needed to sew by hand or using a manual machine. I recently scored one at an auction for a cheap price, parts are still available for them and they are really a lot easier to use than I thought. • Build or buy a small forge to introduce the basics of blacksmithing to a loved one. • If the loved one lives on property that has ample firewood available, yet the person does not have a fireplace, buy or build an attractive fire ring or self-contained patio version of the same and a nice ax (decorate the ax by adding an engraved or wood burnt design on the handle) to start introducing outdoor skills to the loved one. • Solar charger that can handle powering a cellphone, emergency radio, or similar electronics. • A set of handheld radios for a couple. • A gardening kit in a bucket. Sew a tool caddy onto the bucket and put some seed packets, a gardening book (printout in binder) and some planting hand tools inside. The introduction to growing your own groceries could inspire the loved one to expand their gardening skills further. • Give the loved one a chicken – ok, maybe not to take home with them, but buy or hatch a chick that belongs to them – and so will all the eggs the hen produces. Give a photo of the chick to the love one to keep and email or text photos and videos of the chick as it grows. Hopefully, the love one will be intrigued by their gift and start coming over to your homestead/prepper retreat to spend time with the chicken and collect their own eggs. Present the gift with some of your own farm fresh eggs inside an attractive egg-collecting basket. • Make a target or an entire target range, for friends and family who enjoy shooting guns and bows. You can paint a deer onto a piece of plywood, make hanging and moving targets out of painted tin cans and milk jugs. Paint interesting targets on an old sheet, cut them apart, and secure them to a bale of straw for a cheap and fun bow target. • Forage some seasonal goodies from the woods and put them in an attractive container along with a field guide the loved one can use to find their own free food. If possible, make a delicious smelling soup, stew, or meat rub using the forage food to include with the gift. • Buy a dehydrator and fill several Mason jars with food you have dehydrated from your garden. Include a dehydrator recipe book with the gift, as well. • Make a batch of mead or wine in your still and give it along with either a complete still or directions on how to make one, to a love one you want to inspire to become more self-reliant. • Using an old pallet, make a vertical herb garden and gift it to a non-prepping loved one. • Build a cold frame out of scrap wood an an old window and gift it along with a bucket of compost and seeds to a gardening fan who would enjoy learning how to start their own seeds or expand their growing season. • Need a big gift for an adult child or their entire family? Dig them a pond and stock it with fish. Present a homemade gift card for the stocked pond along with a fishing pole or cookbook designed for anglers. • Buy a tent and or camping supplies and give it along with a gift card for a nearby state park. • Have a loved one that already enjoys gardening but doesn’t can their harvest? Get them started with a basic set of canning tools and a cookbook filled with recipes – or a printout of your own recipes placed inside of a binder. • Build a bench, cabinet, or piece of outdoor furniture and present it to the loved one with a gift card for free woodworking training sessions. • Put a compass, binoculars, emergency whistle, a homemade walking stick and handmade map inside of an Alice pack. The map will lead the loved one to the rest of their gift that you have hidden in the woods. • Make an attractive wood crate and fill it with canned and dehydrated goodies from your garden. Present it with a photo of an outlined patch of dirt with the loved one’s name spray painted on the grass to mark the area you are gifting them during the next growing season. • During your annual Christmas party, feed the guests only long-term storage food to eat. Give each loved one their own packet of long-term storage food to take home with them. • Give a sampler of essential oils and spices in an attractive basket or wood box along with a printed guide of how to use them to make natural home remedies. • Make a health and beauty kit filled with homemade toothpaste, shampoo, household cleaners, skin care items, chap stick, and similar items along with directions for how to make the natural care and cleaning items themselves. • Hand tools, like a manually-powered drill, pocket augers, etc. for the men on your Christmas list that love tools, but only know how to use the kind that plug into the wall. • A set of cast iron cookware and a cookbook on how to use and season their indoor/outdoor cookware. • Attractive composting pail with a lid and a printout of how to cultivate quality soil, how to test the soil, and the best items to compost. • A grinding mill with a cookbook full of recipes to use when making your own wheat flour, cornmeal, and acorn flour – along with a delicious fresh out of the oven bread you made after grinding your own flour. Present the gift with an attractive bag of dried corn, wheat berries, or acorns. • Oil lamps. Fill them with colorful oil, put a pretty lamp cover on them, and include a printout that details how to make lamp oil using olive oil, vegetable oil, and how to make your own wicks. • A miniature fruit tree or non-native dwarf fruit tree in a container that can be moved indoors during the winter. Cut starts from your own native fruit trees and berry bushes and present them with an attractive wood sign that can be staked into the ground. Put a catchy phrase, the loved one’s name, or other personal message on the sign that will be placed at the entrance to the fruit grove. If only a single tree or a few bushes can be planted due to the smallness of the loved one’s yard, that is fine too, and still worthy of an attractive sign as part of the gift. • Give a fermentation crock along with a cookbook of recipes that can be made using the crock. • Expand the knowledge of an avid canner in your family by giving them a cookbook that will teach them Amish or off grid methods of food preservation – along with some extra Mason jars or lids, can’t ever have too many of those! • Fill a bucket or basket with homemade fire starters for the folks on your list who have a wood burner or fireplace, or already enjoy camping. Give a printout with directions on how to make your own fire starters. • Give a squeeZo food mill along with a cookbook teaching them how to make their own jams, jellies, and tomato juice. • Expand upon the woodworking or wood cutting outdoors skills a loved one already has and buy them a portable sawmill attachment for his or her chainsaw so they cut their own boards. • Have a loved one that already keeps chickens? Spend just a few dollars to purchase plans detailing how to build their own egg incubator – add a gift card for the supplies required if it fits your budget. • Give a dinner and a movie – a survival movie and a complete meal comprise only of long-term storage food, including a powdered drink and ice cream or some other sweet dessert. While having fun making something cool, any man,woman, or child who receives these kits will be learning a new skill that can come in handy after the SHTF. • Bow making kit – you can make a recurve or even a compound bow, out of PVC pipe and a few other easy to find and cheap materials. • Buy a reloading kit for the guy and gals that already like to target shoot and hunt. Help them take their skills to the next level by learning how to make their own ammo. • A tabletop butter churn and related supplies. • Build your own picnic table kit – hardware but wood not included with the kit, add a gift card to the local hardware store. • Make your own cat condo or tower kit for the feline lovers on your Christmas list. • Sew your own dog bed or dog car seat cover kit for the canine lovers on your shopping list. While none of these gifts are likely on the top of the Christmas list for the children in your life because they are not advertised during cartoon television shows, they will inspire and intrigue the little ones and quite possible become one of their most memorable presents. You can find these toys, or the supplies to make them, from a vast array of both brick-and-mortar and online retailers. I chose specific titles for each toy that matched the ones used on most big box store websites, including Amazon. • Build your own fairy house or dollhouse kit – get the girls in the family interested in woodworking and using tools. • Tin can microphone kit – teach children how to communicate without the use of technology and how sound travels. • Child’s sewing machine with kits or free downloaded patterns for making their own doll clothes, pillows, and other simple beginner projects. • Child gardening kit – make this yourself and save a lot of money while providing a much larger gift. After purchasing the standard gardening tools and gloves available at most farm and garden stores, add a whimsical tool caddy to a small bucket and fill it with items similar to the ones used in the adult version. You could also include small clay pots and art supplies so the child can decorate their own gardening containers to put outside or in a windowsill. • Homemade coupon book for learning sessions or field trips designed to get them outdoors and learning. • Child appropriate shooting range to go along with a BB gun, Nerf gun, bow with suction cup arrows, or even a squirt gun. I made a kiddo shooting range on our prepper retreat and it is a hit with kids of all ages. When using squirt guns, I fill the guns with colored water so the children can track who hits what target and where. • Barbie and similar dolls with outdoor and hunting accessories – these only became readily available last year. Tractor Supply and Rural King are a great place to find these type of non-traditional dolls for little girls. • Make an obstacle course out of wood, tree stumps, rope, old tires for your children or grandchildren. The children will be building strong bodies and learning how to overcome obstacles while competing against each other or their own previous completion times. • Built a wood playhouse or clubhouse WITH your children or grandchildren. They children can learn how to use tools safely, how to design a simple structure. How to sand wood, sew curtains, make simple furniture to go into the playhouse or clubhouse, and how to “power” their play structure using solar lights. Print off a photo of a one or more of the many playhouse or cubby houses, and use it as part of a homemade gift card to unwrap when presenting the gift. • Purchase make-believe camping gear – cook stoves, lanterns, and even glowing campfires complete with wood that can be “chopped” with a toy ax, are available online. You can also make your own pretend fire, logs, and an ax – as well as play camping food, out of felt. After looking at the high price for felt pretend camping and food items online, I decided to make my own, and they were (and still are) a huge hit with the grandchildren. I used toilet paper and paper towel rolls to give shape and weight to the stuffed ax and knife that I made out of felt. I also made a fishing pole (same type of handle crafting) with a magnetic end, felt fish with magnets inside, and a fold out pond themed play mat to introduce fishing skills to the toddlers and preschool age children who frequent the playroom at our house – and for rainy day fun for children of all ages. Ok, so these gifts will shout “PREPPER!” in the minds of the recipient, but the box coverings are enticing enough that even someone who mocks your self-reliant lifestyle won’t be able to resist opening it up and playing just once. That one time will likely get them hooked, even if they don’t want to admit it. The preparedness game recipient will start to learn about survival skills from inside the comfort of their own homes. Playing the games will surely get your love ones thinking about how they would handle the situations they are presented with and leave them pondering the many possible types of disaster scenarios and responses that, being non-preppers, they really hadn’t paid any mind to before. Doom and Bloom Survival – This is my absolute favorite survival board game, and not simply because its creators, Dr. Bones and Nurse Amy, are acquaintances of mine. The medical professionals created one of the most in-depth, realistic, and exciting survival games on the market. In Doom and Bloom Survival, a SuperFlu has gone global and your character is one of the lucky survivors. The marauding hordes have ravaged the wilderness, leaving no readily available resources. You can find the essentials needed to survive, but only if you overcome the obstacles required to acquire and keep them. The supplies will definitely give you and edge in your quest to survive. You must find the few settlements left to give your group a temporary safe haven, after scouting the camps carefully first. The survival board game is designed to be played by 2 to 4 players, but can be adapted to be played either alone or by up to 6 players. It takes about half an hour to 2 hours to play, depending upon the chosen scenario. City of Horror – Game players have to battle a marauding horde of zombies that are invading their city. This game not only touches upon the technical aspects of survival related to the presented scenario, but the mental and emotional ones as well. To win…survive, you may have to choose to forge partnerships you would prefer not to enter into or betray your friends. Players can control more than one City of Horror game character at one time and capitalize on their respective abilities. During the game, which typically takes about an hour and a half to play, participants search for a zombie vaccine, while scavenging for supplies, as they attempt to reach an evacuation helicopter before becoming a snack for the walking dead. This survival board game is designed for three to six players. Wildcraft! An Herbal Adventure Game – This cooperative fun for the whole family preparedness board game teaches players about 25 of the most important medicinal and edible plants they will find in the woods. Players connect icon on the challenge and “trouble” cards with the appropriate plant card. The players must use strategy during the drama-filled game if they are going to make it up the mountain safely and reach Huckleberry Patch – and then get back to grandma’s house, before darkness falls. If the you don’t make it back on time, you will still survive, because grandma is a loving soul and will go out into the wilderness to find you. The storytelling aspect of the game should entertain both children and adults. Wildcraft! An Herbal Adventure Game is designed for 1 to 4 players and comes complete with a story download that enhances the board game experience. Oh No… Zombies! – In this competitive game, your character is trapped inside a building that is surrounded by zombies . Modern conveniences, such as cellphones and landlines, are no longer worker. If you get bit while trying to escape, you turn into zombie and attempt to attack the other players. If you get out of the building, you must try to make your way to a store and find available supplies, which include a gun and a radio. The game takes about 30 minutes to play and is designed for 2 to 4 players. The Appalachian Trail Game Backpacking Edition – Players must learn how to identify both plants and animals, garner the concepts of camping skills, basic first aid, in order to make it off the trail successfully and safely. The game is appropriate for at least middle elementary school age children, but remains an engaging learning experience for adults, as well. Players learn about the history of the Appalachian Trail while playing the game. To win the game, you must use all the gear in your backpack to make it from one end of the trail to the other. The players can become injured while in the woods and require first aid. The game, which is designed for 2 to 6 players, takes about 30 minutes to play and also educates about various aspects of life in the woods, including plant life. Outdoor Survival – This cooperate game is an ideal way to introduce the concepts of preparedness to older children and non-prepping adults. The group of players are lost way out in the middle of a vast wilderness. They must battle the elements, wild animals, find potable water, and food, in order to survive. It takes about 40 minutes to play Outdoor Survival. The game is designed for 1 to 4 players. Each scenario in the various decks presume the SHTF and the world is in the midst of complete chaos. The cards are dealt to each player and they take turns reading a question to the person sitting next to them. The player has only 3 minutes to explain how he or she would deal with and survive the situation presented. The other players rank their response and the person with the most points at the end of the game, wins. Many survival book designed to teach or expand preparedness skills overall or on a specific topic exist and are worthy of our hard-earned money. But, for a non-prepper gift, a scenario driven SHTF book will be a better fit. The reader will learn from the survival action successes and failures of the characters – but will not be subjected to material that is over their heads, could be essential buy rather dry reading, or would immediately turn them off and convince them to close the book and toss it back up on the shelf…forever. Survival books, especially Dr. William R. Forstchen’s One Second After, also make excellent gifts for non-prepping friends and family. This book, the one that caused Forstchen to be dubbed the “Father of the Prepping Movement,” teaches awareness, in an often heart wrenching way through the scenarios the heroes and villains, and a folks in between, go through in order to survive and hold onto power. One Second After begins just shortly before disaster strikes and allows the reader to become fully immersed in the life of the main character, his family, and small town community as the full impact of life post-apocalypse unfolds. Even non-preppers should find the book almost impossible to put down. Thankfully for folks coming to One Second After more than a decade after it was written, there are now equally great sequels that bring more thought provoking scenarios to ponder about what happens post-SHTF once “order” is restored to at least some parts of America. The book is also available in audio book format. Lights Out Saga is another excellent scenario driven book. The storytelling focuses on what life is like as the doomsday disaster is happening. The confusion that something really bad is actually going and the desire to remain stationary and wait for the government show up to help, by the general populace, should inspire non-preppers to become more self-reliant after they finish the book – likely before they get to chapter 3! David Crawford’s characters are extremely easy to relate to for both preppers and non-preppers. 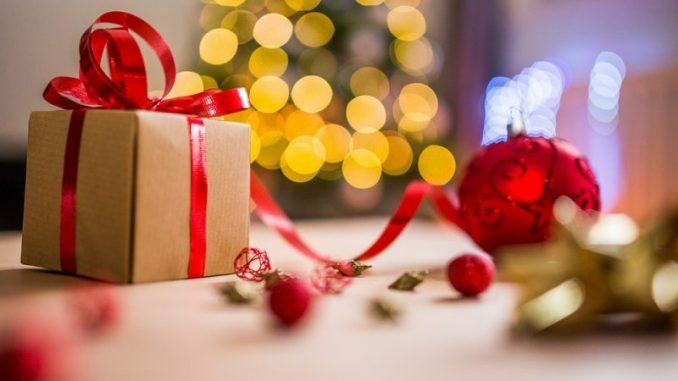 If you make or buy any of the gifts for non-preppers on this list, whether for Christmas or another gift giving occasions, please share their initial reaction and any future preparedness actions that ultimately resulted from your inspiration gift, in the comments section below.